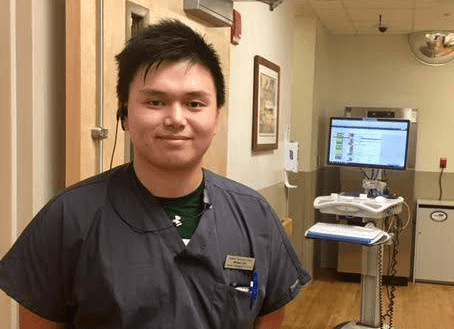 William Li has big plans for a career in health care, and Mount St. Joseph Academy and Stafford Technical Center in Rutland are helping him achieve his goals. MSJ students are eligible to attend Stafford Technical Center to combine extended technical education with their MSJ classroom learning and student life experience. They may choose from any of the programs offered at Stafford, with many of these technical programs having articulated agreements, transcript credit and dual enrollment options with Vermont state colleges, which allow students to earn college credits while at the technical center. Will, an MSJ senior, who also attended Christ the King School in Rutland, is currently getting hands-on experience in Stafford’s Health Careers Program. Will is participating in a cooperative work experience, where he works in various healthcare facilities to gain job experience. He has worked two quarters in an emergency room and is planning on trying out radiology in the next quarter. As a bonus, Will gets paid for the work he does as part of the program. “I knew I wanted to go into the medical field, and I knew previous MSJ students who went to Stafford. I talked to them and they said it was a nice program that I should try,” Will said. Will says the combination of MSJ and Stafford has helped him academically and to position him for his career goals. Will said the working portion of his program fills up a big chunk of his day, so he takes dual enrollment courses at Community College of Vermont to meet his academic needs. He will finish high school with 18 college credits. After high school, Will is planning to go to college to study pre-pharmacy and then go to pharmacy school. He hasn’t selected a college yet, but he has applied to eight schools and is keeping his options open while he makes his decision.